Potatoes are delicious in any shape or form. I love mashed potatoes, especially on thanksgiving, but sometimes with all of the casseroles, everything tends to be the same texture...mushy. Not in a gross way! I love a sweet potato casserole and stuffing is devine but it's nice to switch up the texture game! 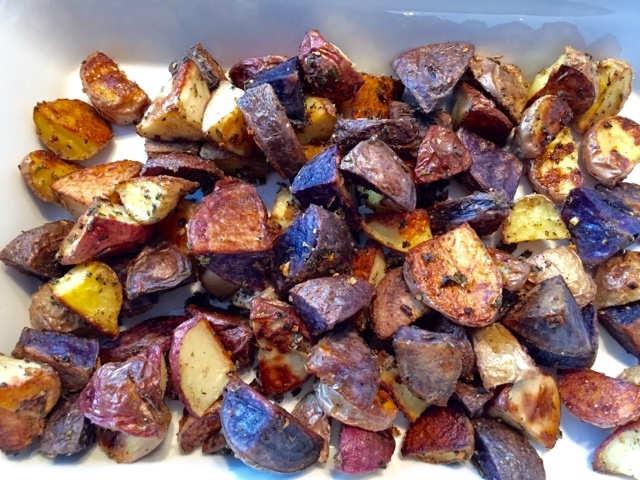 I like these roasted potatoes because they are colorful, crispy, herby, and crispy. Shoot, did I say crispy twice? Well, these potatoes are crispy! The herbs are such a lovely combination and when eaten with those Languedoc wines...holy cow! 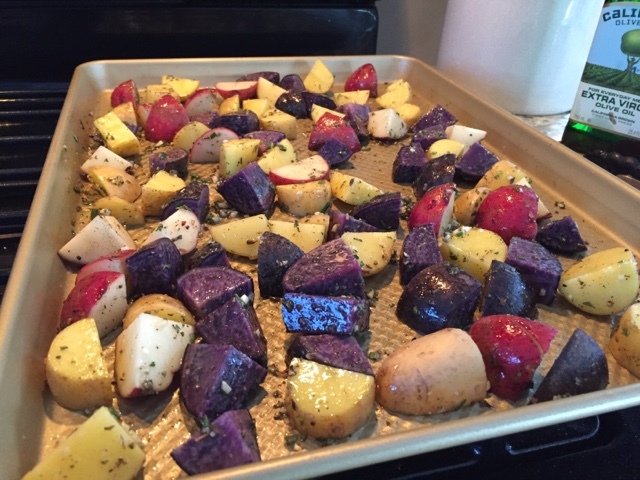 Toss the potatoes on a nonstick sheet pan with the oil, salt, pepper, herbs, and garlic. Spread them evenly and pop them in a 425 degree oven. Roast for 25-35 minutes on one side, flip them over and roast for an additional 15-20 minutes or until they are cooked through and crispy! *Can be cooked halfway the day before and finished cooking the day of! 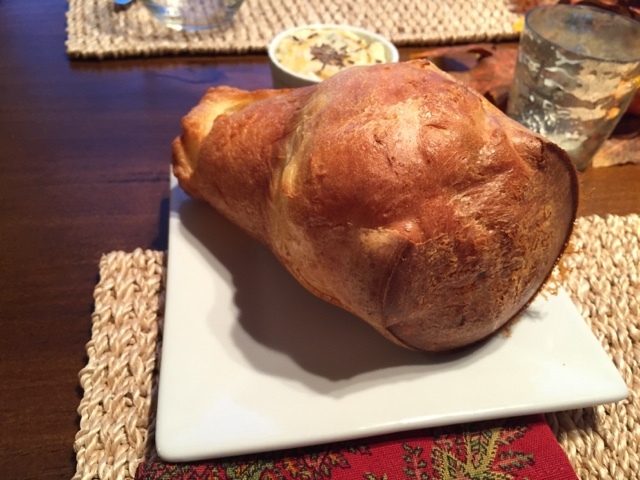 Popovers. Let's just take a minute to talk about these baked gems! If you've never had them, they are basically a roll. They puff up in the oven and get super crispy on the outside and hollow on the inside. The word "eggy doesn't sound appealing but that's the only way I can describe the inside texture. 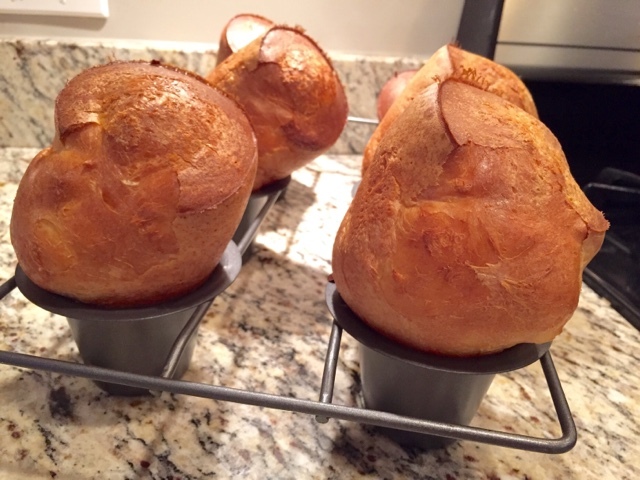 Typically these can be made in a muffin tin but for height I would recommend an actual popover pan. 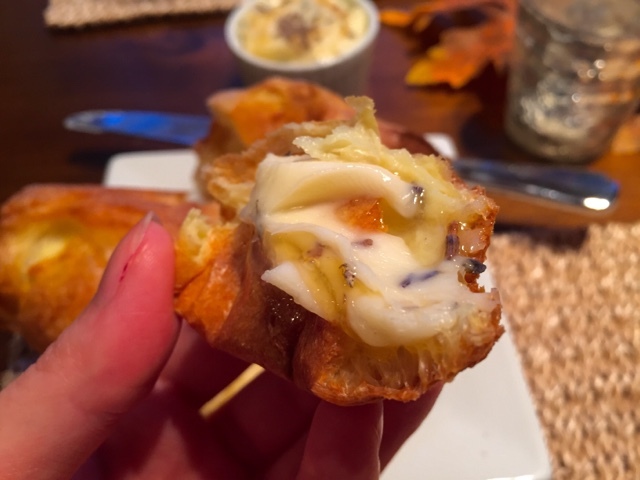 I have a little secret about this recipe...it's the same recipe used at a famous restaurant that's known for popovers. 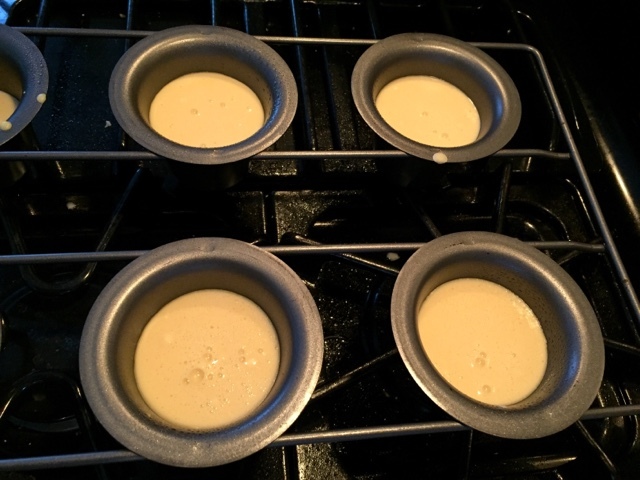 Start by preheating your oven to 450 degrees and place your popover or muffin tin in the oven to preheat as well! 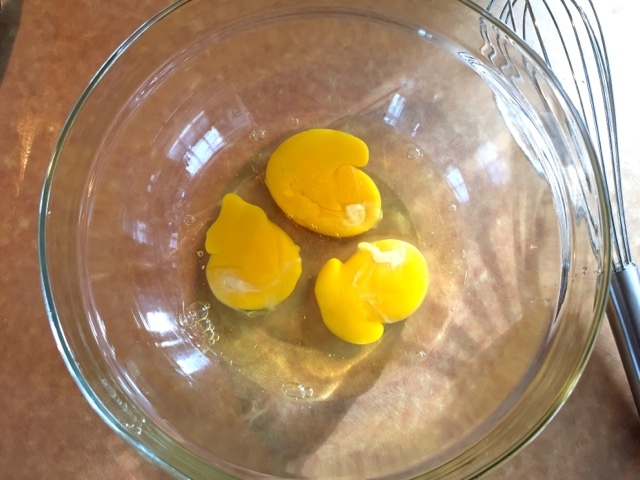 Then, crack your eggs into a mixing bowl. 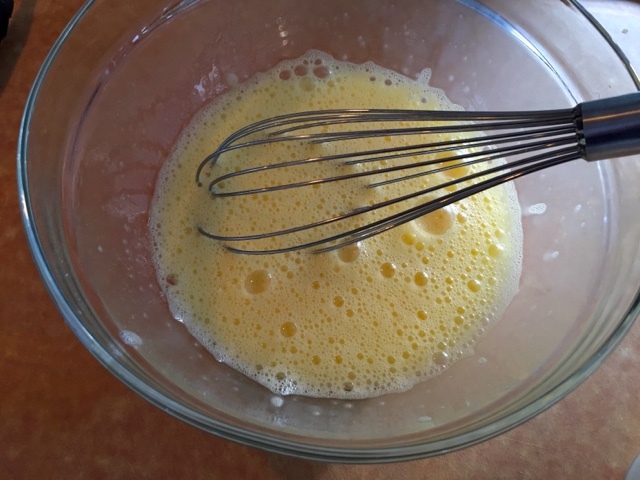 Whisk for about a minute and a half until the eggs are foamy. This takes a bit of energy but the calories you lose will totally make up for it in a bit! 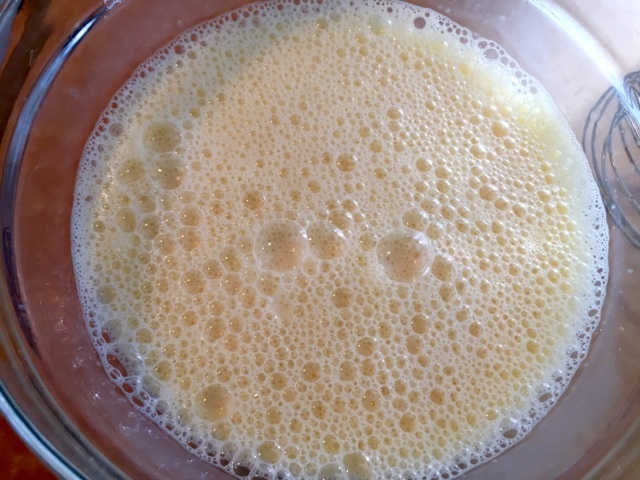 Now, add in your milk and give it another whisk. 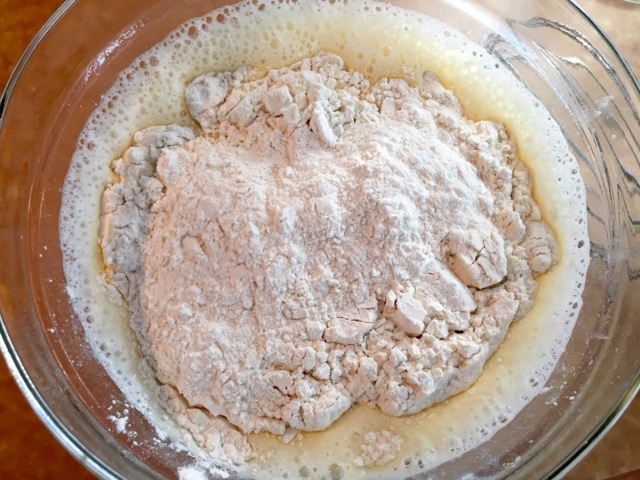 Dump in your flour, all at once. 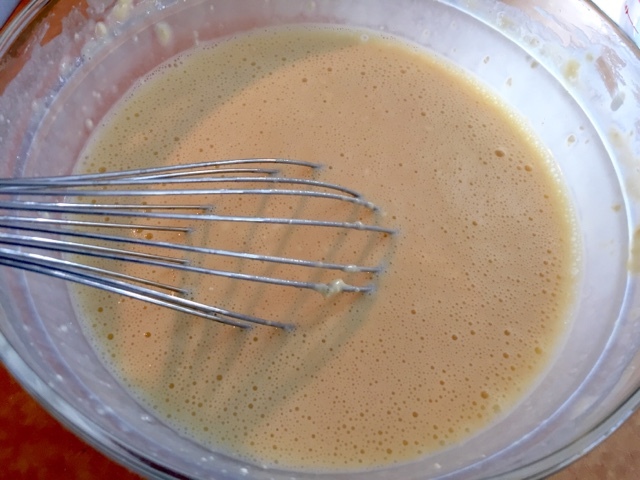 Whisk gently just until the flour is well combined. Do not over mix this!! Pull your pan out of the oven and carefully spray it with nonstick cooking spray. You could also brush melted butter into the wells...nothing wrong with that! Fill each one about 3/4 way full. Here's the most important part-bake these at 450 degrees for 15 minutes and then lower the temperature to 350 and bake for another 30 minutes. Do not open the oven door, not even for a quick second during the baking process. There's something magical that happens in the oven and if you open it, they deflate and look sad. 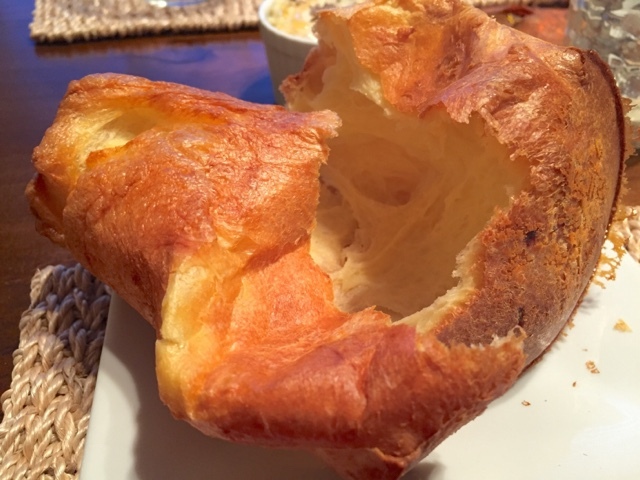 Nobody likes a sad deflated popover! Take them out and let them cool for a couple minutes. While those are baking, let's make the butter. It's important to have really soft room temperature butter. 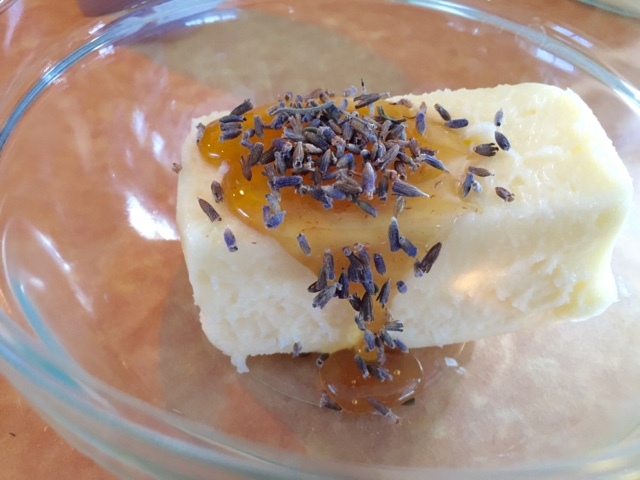 In a small bowl combine the butter, honey, and lavender. Stir to combine and transfer to a little serving bowl. You could also spread on a small baking sheet, let it harden, and cut festive shapes with a cookie cutter. Your call! I then finish the top of the butter with a little swirl of honey and a sprinkle of flaked salt...it adds a nice crunch! See how hollow it is?! The inside is soft and slightly eggy but the outside is crisp and wonderful. 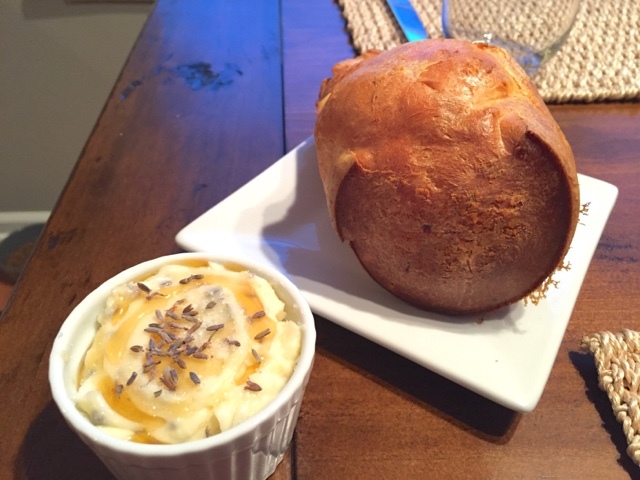 Spread with that lovely lavender honey butter and just enjoy. Take a moment of silence, baking is hard! You deserve wine to wash it down. I'm in a state of confusion how the holidays arrived already but I'm so excited for Thanksgiving! Although I don't actually have a big role cooking the meal, I like to play sous chef for my parents and jump in to help baste, play Tetris with reheating sides, and carving...aka pick at the crispy skin! Normally my parents host to a large group including my sisters, their husbands and kids, and relatives near and far but this year, it's just my parents, Nana, Sean and I. It'll be weird and quiet but truthfully, I don't mind! It might be nice without the chaos of our usual large crew! I think the key to a stress-free day is parcooking every side dish. If a cold uncooked casserole goes in the oven, it'll take a lot longer to cook than just reheating a cooked one! Go through all of your serving platters and utensils and put a label on each tray/dish letting you know what's going on what to be sure you have everything you need. Otherwise, if you realize you broke a bowl and never replaced it it'll be a rude awakening as your trying to get dinner on the table! Get everything possible done ahead of time including plating room temperature or cold dishes so they're ready when you are. 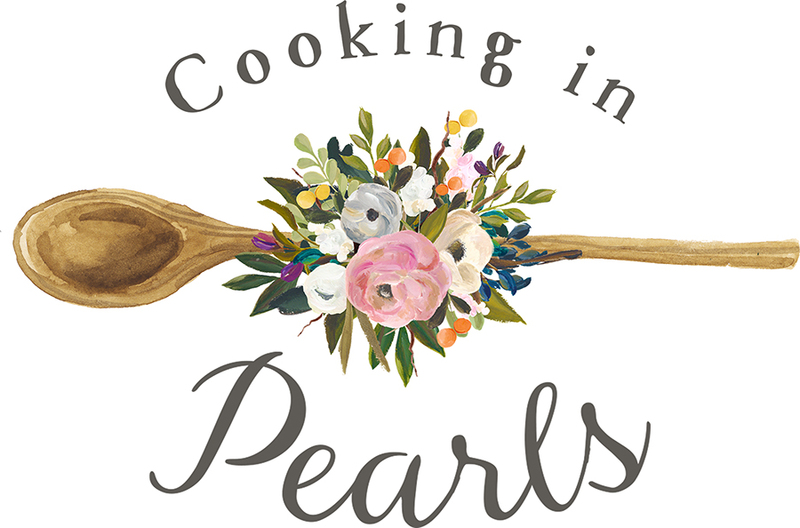 I'm bringing you three recipes that are easy and delicious whether it be for Thanksgiving, Friendsgiving, a fall dinner party or just a regular family dinner! First things first, what are you drinking? Wine? Cool, me too! Which varietal goes best with the big meal you ask? Great question! I have some great recommendations! 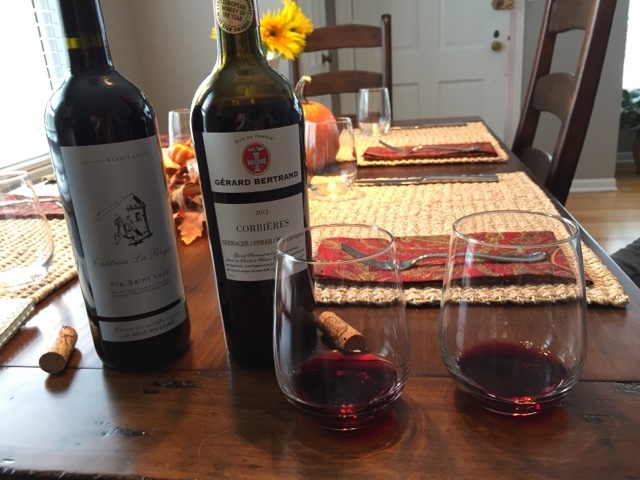 You want to find a wine that complements the meal as a whole so I like to pick out the common flavor such as hearty herbs that are in almost every thanksgiving dish! Thyme, rosemary, and sage. I absolutely love these flavors individually and putting them together is delightful, hello herbs de Provence! Garrigue is the name given to the wonderful collection of wild herbs and plants that grow in Southern France, including thyme, sage, rosemary, and lavender. Lavender is such an under utilized flavor in my opinion! 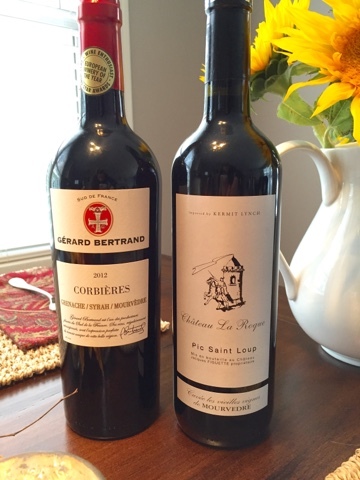 A wino friend of mine recommended I serve these Languedoc AOP wines on my Thanksgiving table and she is not kidding! These are delicious on their own, but if you really want a unique experience take a bite of your herby stuffing and then take a sip of wine...it's a full flavor experience! The flavors are complex and linger longer than say, a California blend. In the Languedoc wine region the grapes are grown within sprawling wild herbs such as sage, lavender, rosemary, and thyme giving those grapes unique earthy notes that pair extremely well with your Thanksgiving meal. Go to your local Binnys and try this flavor experiment on your own! (you won't be sorry!) Of course I also love white wine but during winter months I tend to stick to red...crisp whites aren't so refreshing when it's 20 degrees and snowing outside! 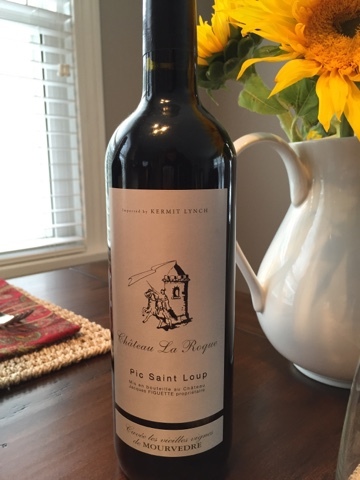 The Pic Saint Loup was fruiter with a lighter body. 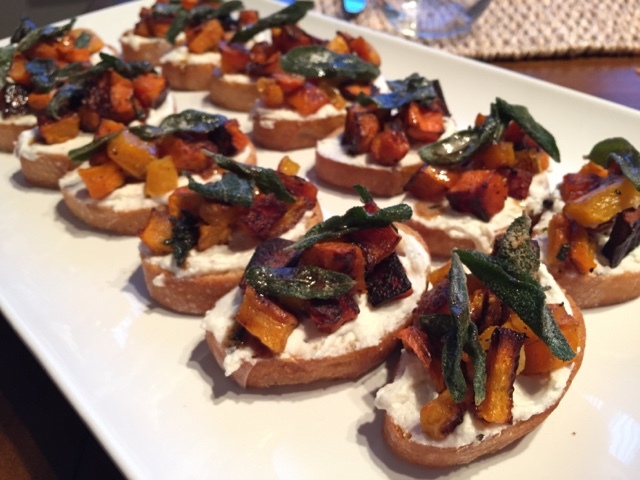 It was nice on it's own but transformed when paired with these butternut squash crostini with sage. It's crazy how food and wine pairings work! 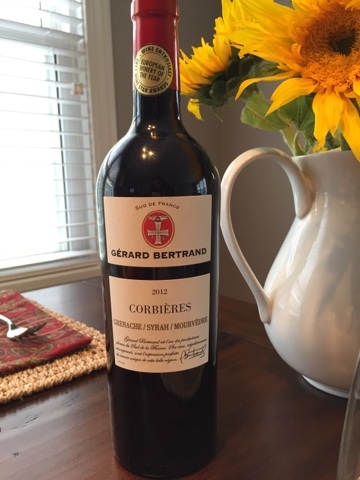 The Corbieres was a fuller body with complex flavors but still finished smooth. This would be a great glass of wine anytime but went especially well with the herb roasted potatoes I'll share tomorrow. 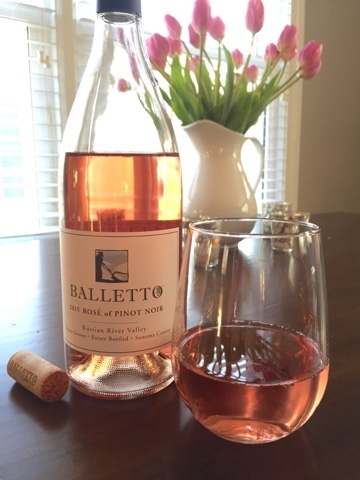 The blend of Syrah, Grenache, and Mourvedre was familiar but with a subtle twist. It was earthier than most red blends I've had which I found surprisingly pleasant. If you aren't hosting it's always nice to bring an appetizer or dessert in addition to a bottle of wine (see above for a great option!) 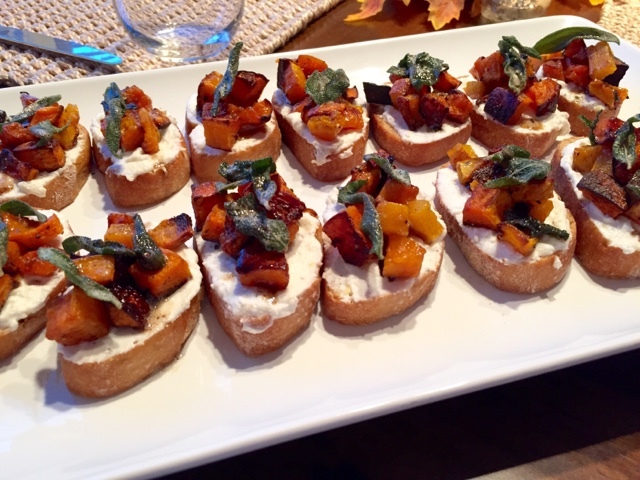 and one of my favorite's is this butternut squash crostini. 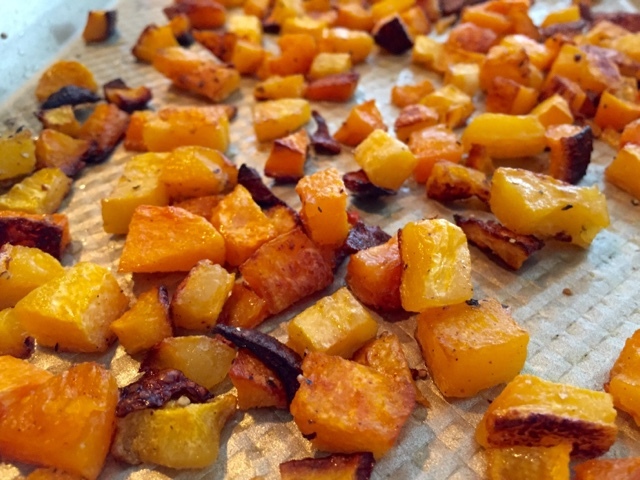 The butternut squash is roasted and slightly crispy which brings out it's natural sweetness and great texture! Toss the butternut squash with the olive oil, salt and pepper. 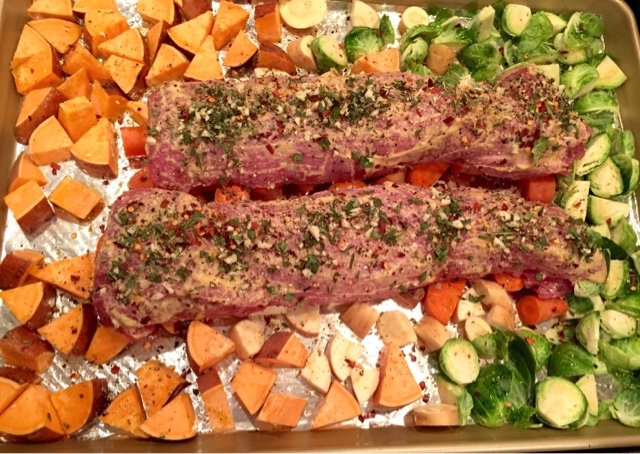 Roast in a single layer at 425 degrees for 25-35 minutes or until golden brown. 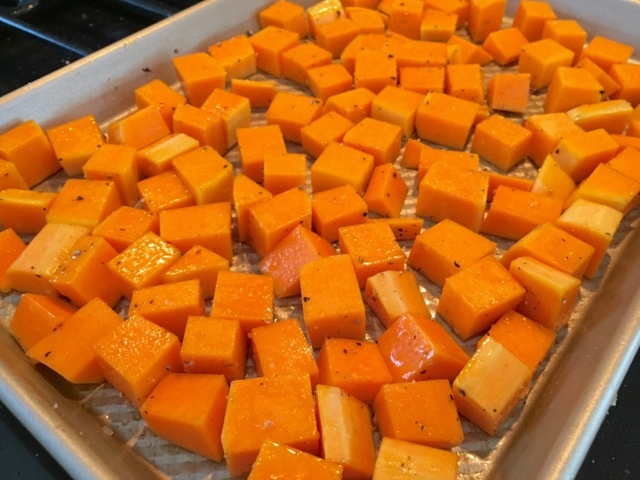 *Toss the squash halfway through to roast evenly. Remove the squash and let cool. Don't be afraid to let it get roasted and slightly browned! 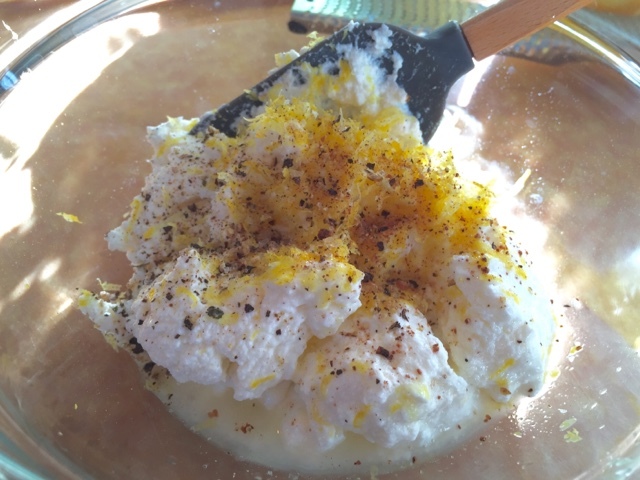 Meanwhile, mix the ricotta, lemon zest, lemon juice, salt, pepper, and nutmeg in a small bowl until well combined. Taste for seasoning and adjust as necessary. The nutmeg should just add a hint of something but not overpower the flavor! It shouldn't be too salty though you want a nice pepper flavor with a subtle citrus note. *orange zest would be delicious too! 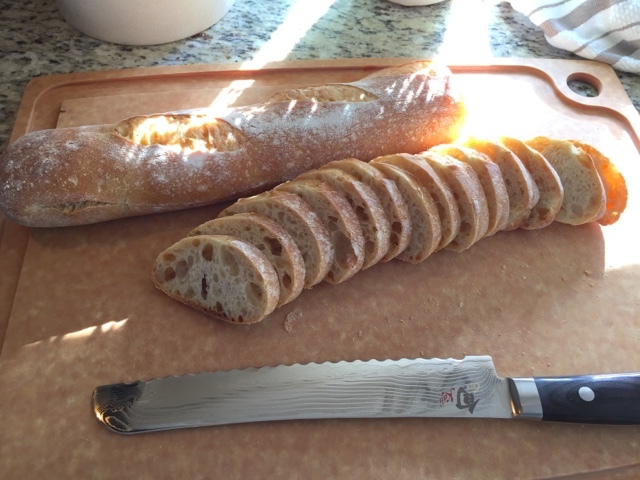 Take your baguette and cut it using a serrated knife into 1/4 inch slices. 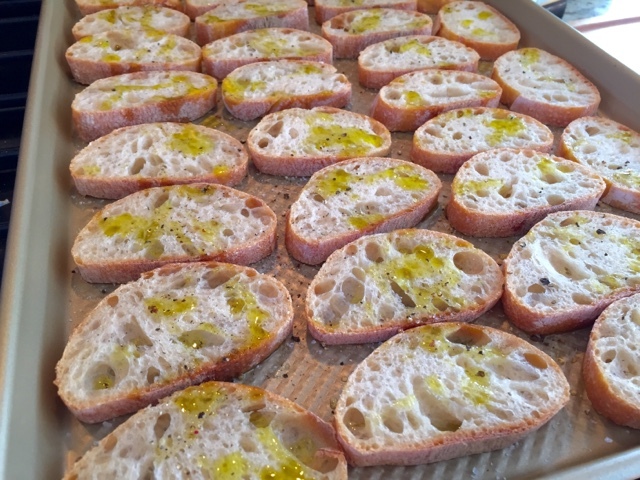 Place on a baking sheet and drizzle with olive oil, salt, and pepper. Bake for about 5 minutes on each side or until golden and crisp. Melt a stick of butter and bring it up to a light bubble, browning the butter until it's nice and nutty. 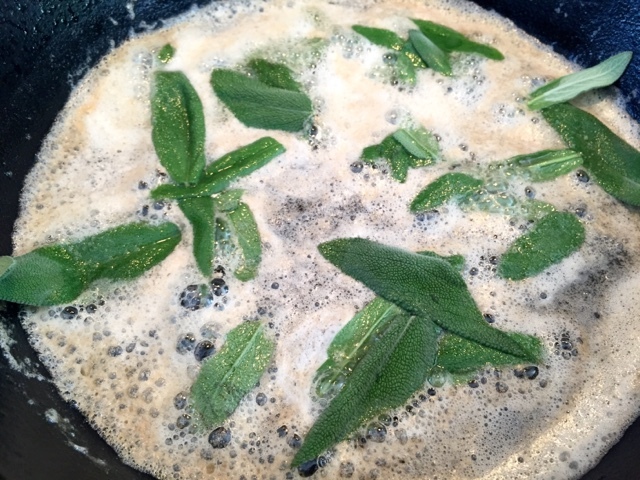 Throw in a handful of sage leaves and stir for about a minute until the sage is fragrant and crisp. Remove the sage leaves to drain on a paper towel. 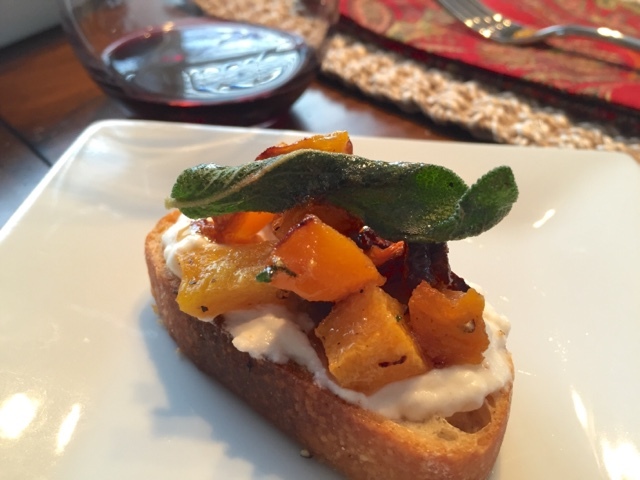 To assemble, spread about a tbl of ricotta on each crostini and top with a few cubes of butternut squash. Finish with a fried sage leaf and a drizzle of that sage-infused brown butter! Yum. If that doesn't scream fall both in color and flavor, I don't know what does! 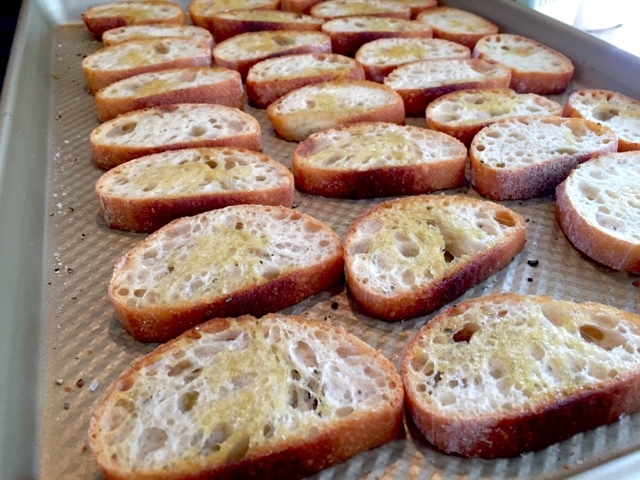 *The crostini, butternut squash, and ricotta can all be made ahead of time! Just store in airtight containers and assemble before serving. Weeknights are always busy and although the cooking process doesn't intimidate me, the dishes do! All too often after I sit down to eat dinner I look in the kitchen and see a mess of pans, cutting boards, and utensils. I try to clean as I go but that doesn't always help. My solution is one pot meals or in this case, one sheet! I love roasting veggies and proteins on a sheet tray (aka cookie sheet) and if the cooking times vary, I'll use two trays (one for the protein and one for the veggies). This is when foil comes into play and it saves the day! These types of meals are a cinch and just requires 5-10 minutes of prep and the rest is completely hands-off. Use a high temperature for quick roasting, about 425 degrees is my go to. 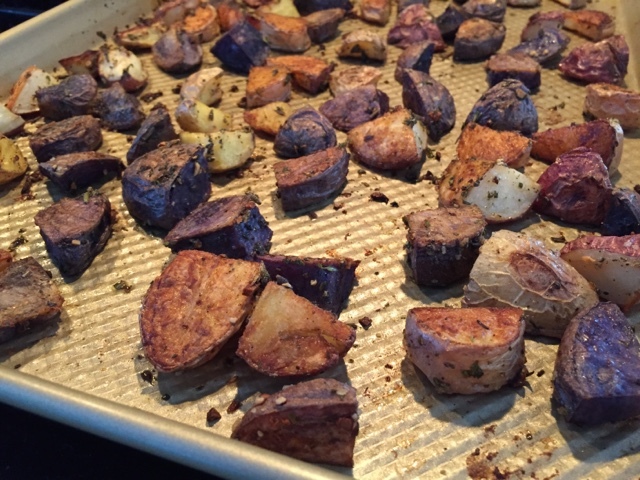 Line a baking sheet with foil to help with messy cleanup and chop up whatever veggies you like and have on hand. During winter months I always have root veggies on hand such as: sweet potatoes, carrots, Brussels sprouts, broccoli, onions, and most recently parsnips. If you aren't familiar, Parsnips are very similar to a carrot but have a little more attitude...so good roasted or even pureed as a sauce! Cut your vegetables into similar sizes (smaller pieces cook quicker!) and drizzle with olive oil, salt and pepper. I use these as a side dish all the time but sometimes with a quick protein like chicken breasts or pork tenderloin, I'll pop that in the middle of the pan and roast them together. It takes about 25-30 minutes depending on your oven and I do flip my vegetables halfway through to caramelize both sides. 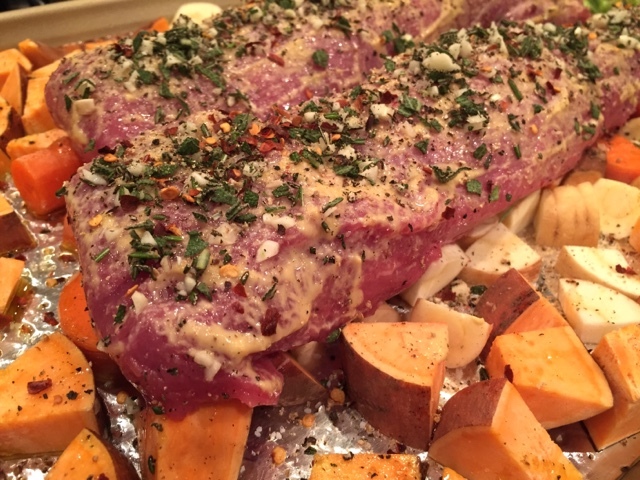 I massage Dijon mustard all over the pork and coat it heavily with chopped rosemary, minced garlic, salt, pepper, and red pepper flakes. *After 20 minutes insert a meat thermometer into the thickest part of the tenderloin and pull the meat if it registers 140 degrees. Let it rest (covered in foil) and will continue cooking to about 145 degrees. Continue roasting the veggies while the meat is resting for additional caramelization if desired. 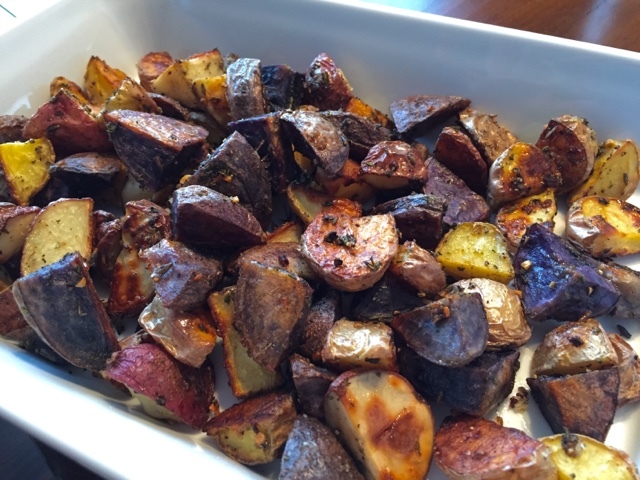 These flavors are very fall(ish) and comforting while remaining healthy and light. *USDA recommends cooking pork to an internal temperature of 165 but most chefs agree that 145-150 is just fine. Otherwise the meat is super dry and tough.